The screenshot from a simulation video shows the magnitude and distribution of forces NPR correspondent Daniel Zwerdling endured on his spine while re-creating the way nurses lift patients from their beds. In this close-up screenshot from a simulation video, you can see the exact moment NPR correspondent Daniel Zwerdling endured dangerous levels of stress on his spine while re-creating the way nurses push their patients in a lift chair. 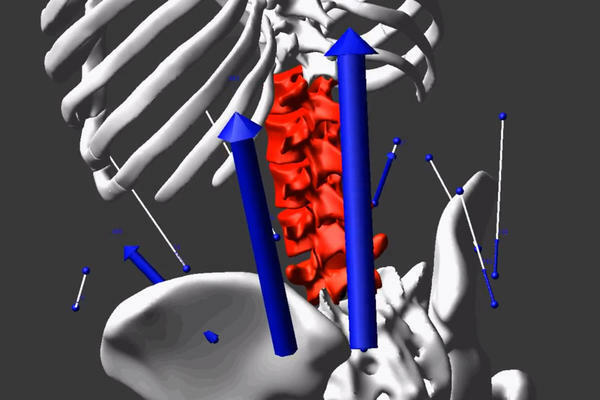 The blue arrows show the high magnitude and distribution of forces from his muscles, while the red indicates the high level of forces on his disks. Scientists say nurses like Sunny Vespico are prime examples of what nursing schools and hospitals are doing wrong: They keep teaching nursing employees how to lift and move patients in ways that could inadvertently result in career-ending back injuries. Vespico, a registered nurse, was working the night shift in the intensive care unit at Temple University Hospital in Philadelphia on March 31, 2012. At roughly 12:30 a.m., a large patient was having trouble breathing, so Vespico and a nursing assistant moved her to a special air bed designed for patients with respiratory problems. "Immediately I felt a pop in my back and pain down my leg," Vespico says. "As a nurse, and understanding the mechanics of the body, I knew that there was something very wrong." An MRI confirmed it: She had herniated one of her discs. And so began a saga of excruciating pain and months off from work. "I am 36 years old," Vespico says. "I've had three surgeries over the last two years. And only now, after the third surgery, I might have a chance of being able to return to being a bedside nurse." Vespico says when she and her colleague rushed to help the 200-pound patient, they tried to lift her using "proper body mechanics" — the way hospitals and nursing schools have been teaching for more than 100 years. According to the online course Nursing Fundamentals, "Body mechanics is the utilization of correct muscles to complete a task safely and efficiently. Keep your back straight. Bend at the knees and hips." But William Marras, director of the Spine Research Institute at The Ohio State University, says "this is why nursing staffs are getting hurt lifting patients." "The magnitude of these forces that are on your spine are so large that the best 'body mechanics' in the world are not going to keep you from getting a back problem," he says. "There's no safe way to do it with body mechanics," he says. Marras and his colleagues published their first results in 1999 in a journal article. The study was small, with 17 subjects. But since then, researchers in the federal government have done their own studies and reached similar conclusions. And today, officials in federal agencies concerned with health issues — including the Centers for Disease Control and Prevention (CDC), the Occupational Safety and Health Administration and the Department of Veterans Affairs — cite Marras' findings like gospel. Prominent nursing groups, such as the American Nurses Association and the National Nurses United union, endorse the conclusion that nursing staff cannot lift patients safely without proper equipment. Yet NPR found that administrators at most hospitals still do not follow the findings. I spent a day at Marras' research center on Ohio State's campus in Columbus to see how they conducted their landmark study. At first glance, his center doesn't look like it has much to do with hospitals. An entire wing looks like it might be an auto factory — with a car chassis suspended in a giant metal cage that can raise, lower and rotate the car body in midair as though it were a toy. Marras says that's because his center has conducted much of its research for auto companies, studying which positions might be safest for workers' backs on the assembly line. But in the late 1990s, an official from Washington state government asked Marras if he would study nursing employees, too. Public health officials in Washington were seeing large numbers of injuries among hospital nursing staff in hospitals and long-term care facilities, and wanted to understand what was causing them and how to prevent them. So Marras' staff recruited a group of nurses and nursing assistants, brought them into the lab, and then had them perform a series of typical nursing tasks as electronic sensors measured the forces on their bodies. If Marras had embarked on that study earlier in his career, it would have been an ordeal for the test subjects. "We used to monitor the muscle activity by loading little wires into hypodermic needles, and punching the needles into the muscles of interest, pulling out the needle and embedding the wire in there," Marras says. "And we've also done things like measured intra-abdominal pressure, sticking tubes up their nose into their stomach." He paid his test subjects, but they made sacrifices in the name of science. By the time Marras launched his nursing study, he had invented, and patented, a piece of equipment that made the research more palatable. It's the "Lumbar Motion Monitor," which looks like a human spine made from an Erector Set. To show how they conducted the study, Marras' research staff turned me into a test subject. They strapped the artificial spine on top of my real one, and connected it with 20 sensors that they pasted on my chest, stomach, legs and back — just as they did with their nursing test subjects. "What electromyography sensors do," said Jon Dufour, a research associate engineer at the Spine Research Institute, "is, basically, when your muscles activate, or when you recruit your muscles, they give off electricity. And we can actually capture that and use that to understand how you're using your muscles internally." Dufour stood back and laughed when they finished wiring me. "So, you are officially the bionic man," he said. "You look like a robot with all these wires hanging off you." Next, they rolled in a hospital bed — and the experiment began. One of their colleagues played the part of a patient and laid down. He weighed about 150 pounds, which is lighter than many real-life patients. About 70 percent of the adult population is overweight or obese, according to the CDC, and many patients in acute care hospitals top 300 pounds. To repeat what the subjects did in Marras' original study, I was supposed to scoot the "patient" to the edge of the bed and help him sit up, then help him into a wheelchair and push him to the commode, then move him from the wheelchair onto the commode, and then do it all in reverse. Marras gave me a quick lesson in "proper body mechanics." But I started straining and grunting as soon as I tried to move the patient. Marras looked alarmed. "You may want to just stop before you actually lift him, so we don't hurt you," he said. I did stop, because just trying to help the patient sit up in bed, I felt uncomfortable pressure in my back. Admittedly, I had not trained in "proper body mechanics" as nursing staff had done, but Marras said my inexperience was not the main problem. Next, we turned to a huge screen and watched something that looked straight out of a sci-fi movie. 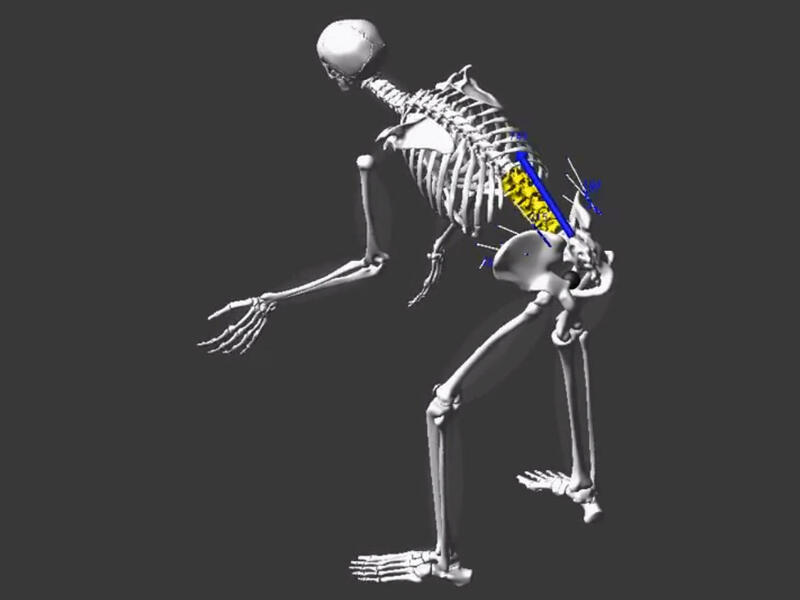 The sensors had captured all of my movements and animated them as a moving 3-D skeleton. As the film version of my skeleton bent, pulled and twisted exactly as I did with the patient, the computer showed the forces pulsing along my spine. "We predict that you wouldn't last very long in this profession," Marras said as he watched. That's because, according to the computer, those forces on my lower back were above the thresholds that cause damage. "We would expect disk problems eventually," Marras said. The laws of physics dictate that it's easiest to lift something when it's close to your body. But nursing employees have to stand at the side of the bed, relatively far from the patient. Nursing employees also often bend over the patient. That's important, because there's a chain of bones along the spine, called facet joints, hidden under the little bumps protruding under the skin. Those bones interconnect and help absorb loads when standing straight. Marras says that when nurses lift as they're bending, those bones disengage and their disks take most of the force. Those forces are "much, much higher than what you'd expect in an assembly line worker," he says. When nurses keep working under these loads, it causes microscopic tears in the "end plates," which are films as thin as credit cards above and below each disc. Those tears lead to scar tissue, which can block the flow of nutrients into the disks — until, eventually, the disks start to collapse. "You could be doing this damage [to your back] for weeks or months or years, and never realize it," says Marras. "The event that caused you to feel the problem is just the straw that broke the camel's back." There's one more striking finding in Marras' studies: Even when two or more nursing employees lift a patient together, they are in danger of injuring their backs. This finding is especially important when you consider that some hospital administrators have formed teams of two to four dedicated lifters, specifically as a strategy to prevent staff from getting hurt. But Marras' artificial spine and sensors show that when employees lift a patient together as a team, physics and biology make things more complicated. For instance, team lifting reduces the amount of weight each person has to handle, and it can reduce "compression" forces on their spines — the kind of forces exerted when a person lifts an object straight up. But Marras' studies show that even teams don't reduce those compression forces to safe levels. Worse: The studies show that lifting patients in teams actually increases another kind of force — shear. To understand shear, Marras says, picture a team at work: Each member is a different height and a different strength, so the lifting is uneven, which forces people to bend — and that leads to bigger forces pressing against the spine sideways. That's shear. "The problem is, our tolerances to that shear are nowhere near as great as they would be to compression," says Marras. "And so we're at greater risk when we're lifting as a team. "The bottom line is, there's no safe way to lift a patient manually," Marras says. "There's no safe way to do it with body mechanics." Yet when NPR contacted hospital officials at random across the country, we found that many are still not acting aggressively on those findings. For instance, we asked Donna McKinney, vice president of acute care services at Exeter Hospital in Exeter, N.H., how her staff learns to move patients. She didn't hesitate to answer: "As part of the orientation, we have physical therapy staff come and show them proper body mechanics," she said. McKinney stressed that the safest way to move patients is to use equipment, such as motorized lifts that hang from the ceilings. And she said some rooms in Exeter Hospital have them. But McKinney acknowledged that most rooms are not equipped. Why? "Money and space constraints," she said. NPR's Robert Benincasa, Lydia Emmanouilidou, Samantha Sunne and Barbara Van Woerkom contributed reporting and research to this story. In hospitals around the country, nurses and nurses assistants are suffering injuries that leave them disabled. As we reported last week, tens of thousands of nursing employees hurt their backs and arms each year. They suffer more injuries than construction workers do. And scientists say it's partly because the age-old method of moving and lifting patients - the method nursing schools and hospitals teach - is dangerous. Today, NPR's Daniel Zwerdling visits one of the laboratories that figured out why so many nurses are getting hurt. DANIEL ZWERDLING, BYLINE: Scientists say nurses like Tove Schuster are prime examples of what nursing schools and hospitals are doing wrong. Schuster was working the overnight shift almost five years ago. TOVE SCHUSTER: It was 5:30 in the morning on Sunday. ZWERDLING: She was working at Crozer-Chester Medical center near Philadelphia. A colleague called out - please, I need help. My patient’s fallen on the floor. The patient was over 300 pounds. So Schuster rounded up a few others, and they started lifting the woman together. T. SCHUSTER: I had her legs - a corner of one of the legs, anyway - and as we swung her up onto the bed, I felt something pop, and I went oh (ph). ZWERDLING: Schuster finished the shift in pain. She went right home to bed, and late that next afternoon, her husband Matt heard her shouting. MATT SCHUSTER: I went upstairs. And she was on the floor, and she was crawling across the floor. And I thought it was a joke at first. And she says I can't walk and my back is killing me. T. SCHUSTER: I was thinking oh my God, what did I do to myself? ZWERDLING: Schuster had to go on disability. She had a grueling operation. She shows me the x-rays. T. SCHUSTER: That the cage - a metal cage - he built around my cord - spinal cord - 'cause he had to remove all of the disk and then pack bone so that it would protect my spinal cord. ZWERDLING: Schuster never made it back to nursing. She says when she and her colleagues rushed to help that patient, they tried to lift her exactly the way they'd been taught. Hospitals call it proper body mechanics. T. SCHUSTER: The mantras that they gave us was to try to keep your back straight, bend your knees, lift using your legs and stand as close to the patient as possible. ZWERDLING: Proper body mechanics - nursing schools and hospitals have been preaching that for more than 100 years. William Marras says no wonder so many nursing staff get hurt lifting patients. WILLIAM MARRAS: The magnitude of these forces that are on your spine are so large that the best body mechanics in the world are not going to keep you from getting a back problem. ZWERDLING: Marras runs the Spine Research Institute, at the Ohio State University. He and his colleagues have studied what happens inside the back when nurses and other hospital staff move patients. And their conclusions have dramatic implications for the hospital industry. Marras says the only way that hospital staff can move patients safely - the ONLY safe way - is if they use machines to lift them, along with other equipment. That would mean that if you go to a hospital, the staff might move you with a ceiling hoist, kind of like factory workers move heavy parts. MARRAS: There is no safe way to do it with body mechanics. ZWERDLING: So your studies have shown that if a hospital doesn't have proper equipment to move patients, they are going to disable their employees? ZWERDLING: And here's one of the most striking things about his studies - Marras and his lab published their first results 15 years ago. The study was small - fewer than 20 people. But since then, researchers and the federal government have done their own studies and reached similar conclusions. And today, officials cite Marras' findings like gospel - at the Labor Department and the Department of Veterans Affairs and the Centers for Disease Control and Prevention. The American Nurses Association tells hospitals we can't lift patients safely without proper equipment. Yet many hospitals still don't listen. I spent the day recently at Marras' research center that's on the Ohio State campus in Columbus. I wanted them to show me exactly how they did their research on nursing staff. At first, the center doesn't look like the place you'd turn to to learn about nursing. A whole wing looks like it might be an auto factory. MARRAS: It's a big laboratory. ZWERDLING: There's a car chassis suspended on a giant metal cage. That's because Marras has done a lot of his research for companies like Honda. He picks up a control box and presses a button. The car chassis goes up. Then he presses another button, and the chassis rotates on its side. Marras has studied which positions might be safest for workers' backs on the assembly line. MARRAS: If you're having, for example, back problems on one particular part of the line and if you change it, will the change be sufficient to solve the problem or will it trade in a back problem for a shoulder problem? ZWERDLING: But one day back in the late-1990s, an official from Washington state asked him would you be willing to study hospital employees, too? She said public health officials in Washington were seeing a lot of nursing staff getting hurt. So Marras and his staff recruited a group of nurses and nursing assistants. They brought them into Marras' lab. And to show what they did back then, Marras and the staff performed the same kind of experiment on me. JON DUFOUR: All right, fantastic. Would you mind changing into shorts? We have a bathroom down the hall. We can use the conference room. ZWERDLING: Jon Dufour is one of the main research associates. After I change, he takes me into a room with laboratory counters and thick electric cables and computers with huge screens. Before they can start the experiment, they have to wire up the test subject. DUFOUR: All right, so now we're going to start putting some sensors on you. ZWERDLING: Because they're about to hook me up to the lumbar motion monitor. Now, Marras and his colleagues invented this years ago. It's basically an artificial spine made out of aircraft aluminum. It looks kind of like they made it out of an Erector set. They strap the artificial spine on top of my real one and hook it up to 20 sensors, which they’re still pasting all around my torso. DUFOUR: What you'll feel is this gel is very cold. It's like they say when you go into the doctor's office. So what electromyography sensors do is, basically, when your muscles activate or when you recruit your muscles, they give off electricity. So we can understand very, very accurately how you're moving and how you're using your muscles internally. DUFOUR: You are officially the bionic man. You look like a robot with all these wires hanging off you. ZWERDLING: Next, they rolled in a hospital bed. MARRAS: It's an actual hospital bed - correct. ZWERDLING: And now the experiment begins. One of their colleagues lies down. He's playing the patient. I'm supposed to move him to the edge of the bed and help him sit up, then help him into a wheelchair and push him to the commode, then move him from the wheelchair onto the commode and then do it all in reverse. Marras shows me how to do it the way they typically teach in nursing schools and hospitals. MARRAS: The way you lift is you put your hand under his knees and you put your hand under his chest like that and try and pull him towards you and then lift. And it's not easy to do (laughter). ZWERDLING: OK, so I'm just going to put my hand on your knees, and I'm going to move them over here? Keep my back straight. Ugh (ph), no, no, it’s right. I can - OK, I'll swing your legs out. MARRAS: You may want to just stop before you actually lift him so we don't hurt you. ZWERDLING: And I do stop. I'm feeling a lot of pressure in my back. Next, we turn to a huge screen, and there's a 3D movie of my skeleton. The sensors have captured all my bending and pulling and twisting and animated it. Check it out on NPR.org. The computer also shows thick blue and red arrows pulsing along my spine. They tell Marras that the forces on my lower back were above the threshold that studies show cause damage. MARRAS: We predict that you wouldn't last very long in this profession, Daniel. MARRAS: Yeah, we would expect disc problems eventually. ZWERDLING: Now Marras says moving and lifting patients with your own body strength is dangerous for a couple reasons. First, the laws of physics dictate that it’s easiest to lift something when it's close to your body. You know that from taking out the garbage. But nurses have to stand at the side of the bed, relatively far from the patient. Second, they have to bend over the patient. And that’s important, because there’s a chain of bones along the spine. They're called facet joints. They're hidden under the little bumps you see protruding under the skin. And those bones interconnect and help absorb loads when you're standing straight. But when people bend, those bones disengage. So Marras found that when nurses bend and lift, their discs take most of the force. MARRAS: These forces were way out of sight. They were much, much higher than what you'd expect in an assembly-line worker. So when we did the analysis on it, we found those - those loads were tremendous. ZWERDLING: And Marras says when nurses keep working under these loads, it causes microscopic tears on thin films called end plates, which are above and below each disc. The tears lead to scar tissue. And the more scar tissue there is, the more it blocks the flow of nutrients into the discs. And eventually, the discs start to collapse. A lot of nurses have told me I think I know the exact moment I injured my back. But Marras says there’s usually not one moment. MARRAS: So what this means to the patient handler is you could be doing this damage for weeks or months or years and never realize it. The event that caused you to feel the problem is just the straw that broke the camel's back. ZWERDLING: Executives at some hospitals have said OK, we realize that it's dangerous for one nurse to lift a patient, so our hospital requires teams of employees to do the lifting together. But Marras found that teams are dangerous, too. MARRAS: The first studies we did were real eye-openers for us. ZWERDLING: His artificial spine and the sensors showed that when you lift someone with other people, it does reduce the amount of weight each person has to lift. And it can reduce a kind of force down your spine called compression. That's the stress your spine gets from, say, lifting something straight up. But Marras' studies show that even teams do not reduce compression forces to safe levels. And worse, the studies showed that lifting patients in teams actually increases another kind of force called shear. Now, picture this - each team member is a different height and a different strength. The lifting is uneven, which forces people to bend. And that leads to bigger forces pressing against the spine sideways -that's shear. MARRAS: That's the problem - is our tolerances to that shear are nowhere near as great as they would be to compression. And so we're at greater risk when we're lifting as a team. ZWERDLING: Even with a lift team with four trained lifters? MARRAS: Correct. There's no safe way to do it with lift teams. The bottom line is there's no safe way to lift a patient manually. There is no safe way to do it with body mechanics. ZWERDLING: But ask hospitals across the country how do you teach your staff to move patients? DONNA MCKINNEY: The nursing staff, when they come on board, go through a general nursing orientation. And we have physical therapy staff come and show them proper body mechanics. ZWERDLING: Donna McKinney is vice president at Exeter Hospital in New Hampshire. We called hospitals at random to ask how they move patients. And McKinney echoed what Marras says. The safest way to move patients is to use equipment like motorized lifts that hang from the ceilings. And she says some rooms in her hospital do have them. But most rooms do not. Simply in terms of what's the best way to protect your nursing staff, would you like ceiling lifts available everywhere? ZWERDLING: So why not install lifts everywhere? MCKINNEY: Money and space constraints. ZWERDLING: Next week, we'll investigate a major hospital in the South. Officials there kept telling their nursing staff you weren't hurt lifting patients, so we don't have to pay for your medical bills. Daniel Zwerdling, NPR News. Transcript provided by NPR, Copyright NPR.